Now that my girls are older, I’m getting more festive for each holiday. I know things can get way out of control and that certain holidays don’t really warrant any fan fair. Before having kids, I’d agree whole-heartedly that anything inflatable was cheesy and obnoxious. And decorating at any time other than Christmas is just over the top. Now that the girls are getting older, I enjoy the magic that a holiday creates for them. Any holiday. It doesn’t even require spending a lot of money to celebrate a holiday. Simple things can really leave an impression and brighten their day. Honestly, this was the first year I’ve done much crafting at all. This was the first time we tried creating St. Patrick’s Day crafts for kids. And while it took minimal effort, it’s still a change from past St. Patrick’s Days. Usually, I just make a point to wear green or put some shamrocks on my bulldog. Even with Easter, as an adult I didn’t decorate much. We still celebrated but before kids, it just involved eating tons of Cadbury Creme Eggs or again, putting bunny ears on my bulldogs. This year I don’t want to break the bank with decorating. Not only because holiday decorations are so specifically timed and short-lived anyway, but also because Easter comes just two short weeks after St. Patrick’s Day this year. So, this being my first year of spending more time decorating for each holiday has brought us to the year of the Easter egg. My first project was even easier than this project and I placed some fake grass and plastic eggs in hurricanes I already had and used those as centerpieces on my dining table. But I wanted something a little more. Something a little more me and a little more sophisticated and adult. 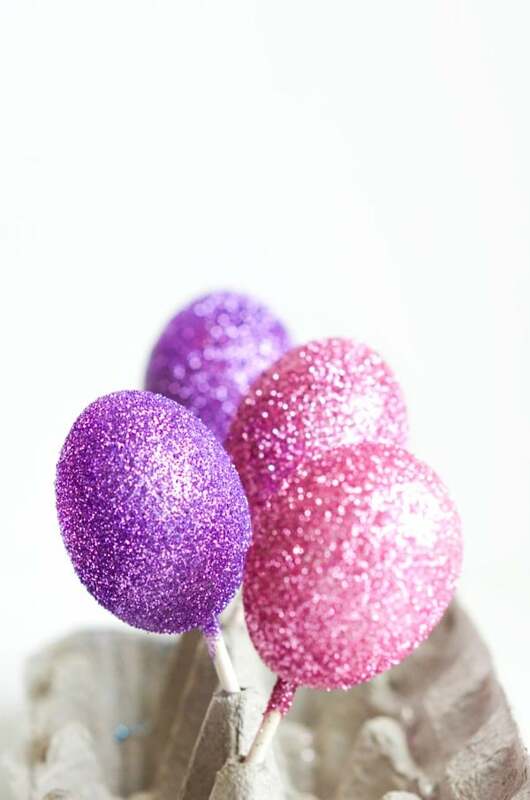 So came the inspiration for these glitter Easter eggs. This project is really quite simple, takes minimal time, and money but is beautiful and unique – my idea of a perfect craft! Optional: empty egg carton for drying. 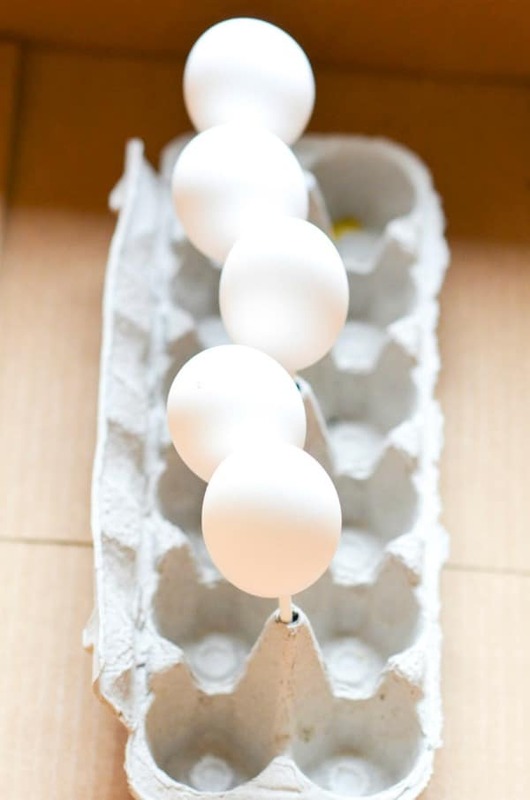 Here are even more egg carton hacks. Wash your eggs and dry them before starting as your mouth will touch the surface of the egg. Using a straight or safety pin, pierce the top and bottom of an egg. 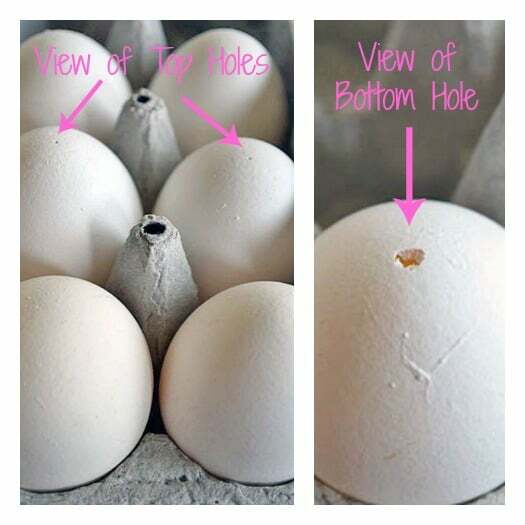 Make sure the bottom hole is larger than the top hole to allow the egg to drain fully. Once your hole has been created, place your egg over a bowl and begin blowing forcefully through the small hole and continue until the contents are drained and only the shell remains. Set aside. Repeat this process for the number of eggs you’ll be using. Using the eggs you’ve blown out is completely up to you. I opted not to because small pieces of shell were in there. But if you’re not feeding it to an infant and don’t mind a little shell, then have at it! Use a fine stream of water to completely rinse the entire shell. You want to ensure there are no egg white or yolks remaining. Set aside to dry. 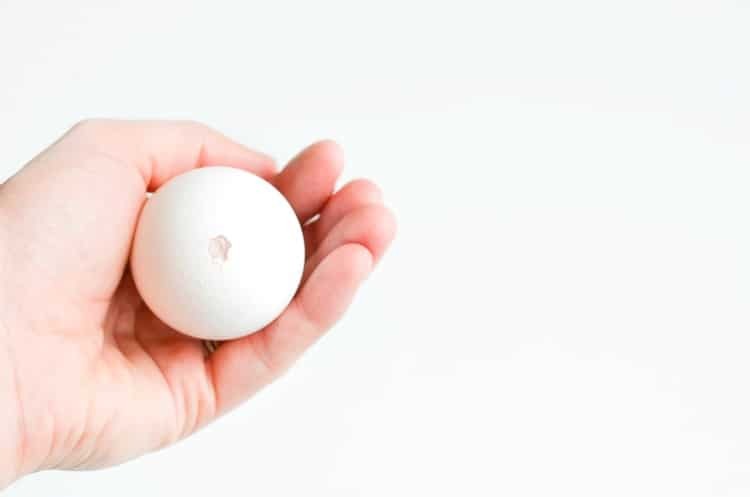 Once your eggshells are completely dry, apply a thin coat of Mod Podge or other craft adhesive using a paintbrush to half the egg. Or, the entire egg if you use the skewers/craft sticks. Usually, I shy away from using Mod Podge because I feel like an amateur. But I started with Elmer’s Glue and it just did not work the same. Stick to the Mod Podge on this one. You could also try Spray Adhesive. 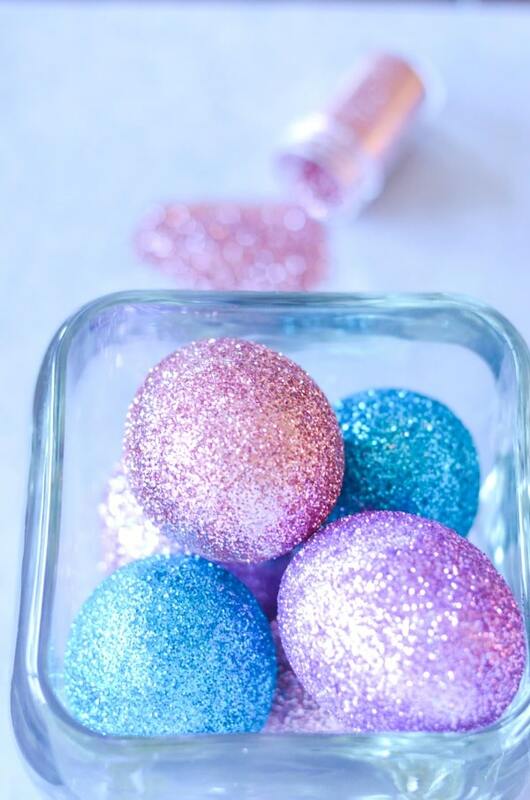 While holding your eggshell over a paper plate, gently shake glitter over egg ensuring you coat all surfaces. This took two passes for me as I failed to plan for holding a Mod Podge covered egg in my hand and allowing it to dry. My suggestion would be to also purchase bamboo skewers or another type of thin craft stick you could insert into the bottom opening of the egg. This makes coating the entire surface to be covered and dry together. 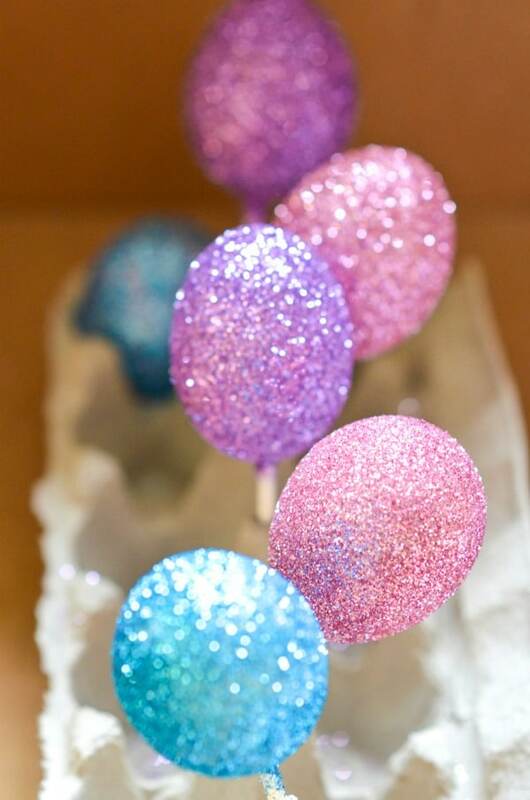 If you use the skewers to coat the entire egg with glitter you can turn an egg carton upside down and stick the other end of the skewer through the egg carton while everything sets and to collect any stray glitter. Then repeat with remaining eggs. If you don’t use the skewers, keep applying Mod Podge to only half of the egg. 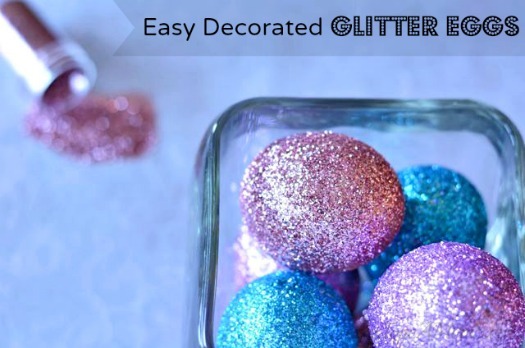 Then apply glitter and then place the non-glittered side down in an empty egg carton. 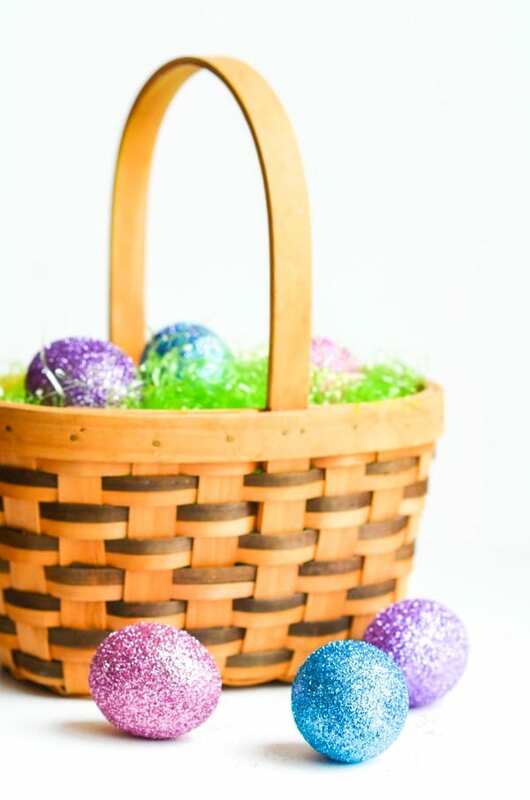 Go ahead and coat the top half of the remaining eggs and allow adequate time to dry and the glitter to adhere before flipping over and continuing. 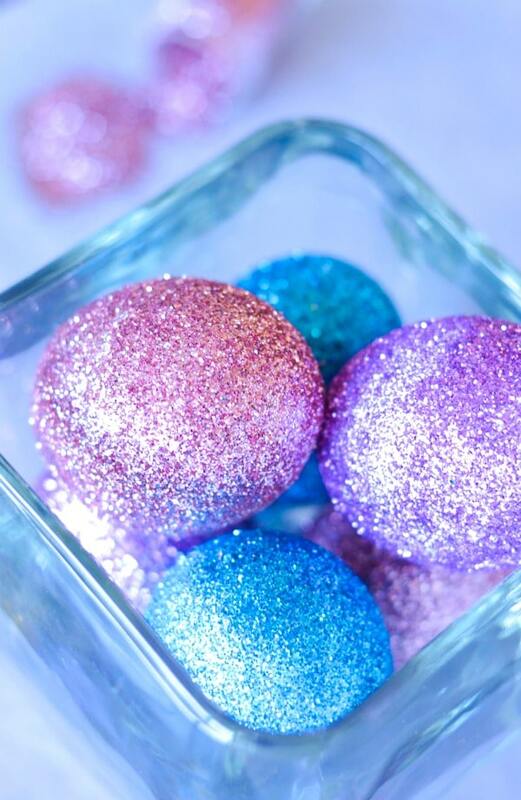 There you have it, glitter decorated Easter eggs that are beautiful to display and easy to make. Even the not so crafty can handle this project. Repeat this process for the number of eggs you’ll be using. Using the eggs you’ve blown out is completely up to you. I opted not to because small pieces of shell were in there but if you’re not feeding it to an infant and don’t mind a little shell, then have at it! Use a fine stream of water to completely rinse the entire shell. You want to ensure there are no egg white or yolks remaining. Set aside to dry. 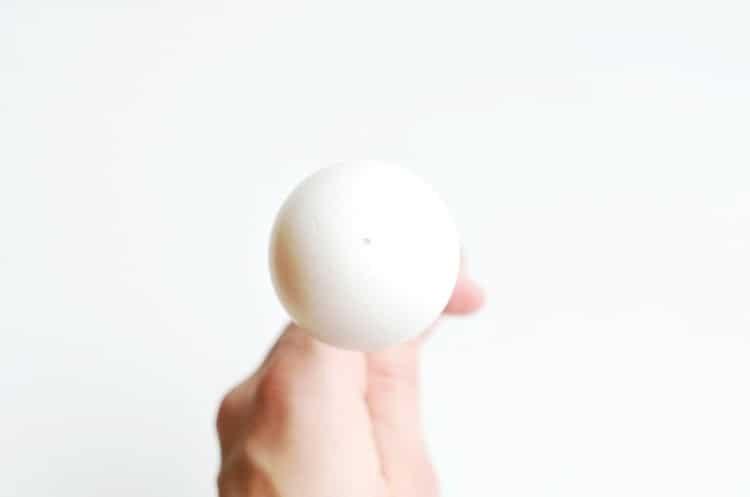 Once your eggshells are completely dry, apply a thin coat of Mod Podge or other craft adhesive using a paintbrush to half the egg (or the entire egg if you elect to use the skewers/craft sticks). Usually, I shy away from using Mod Podge because I don’t feel like an amateur but I started with Elmer’s Glue and it just did not work the same. Stick to the Mod Podge on this one. My suggestion for you would be to also purchase bamboo skewers or another type of thin craft stick you could insert into the bottom opening of the egg to allow coating the entire surface to be covered and dry together. 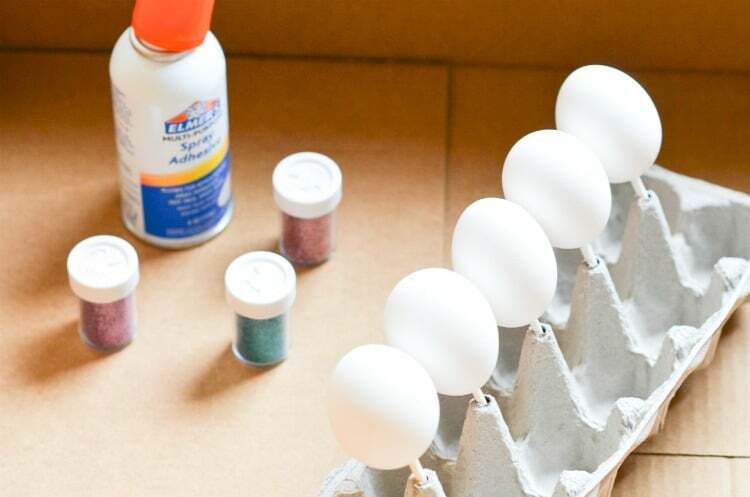 If you do not use the skewers, continue applying Mod Podge to only half of the egg, apply glitter and then place the non-glittered side down in an empty egg carton. 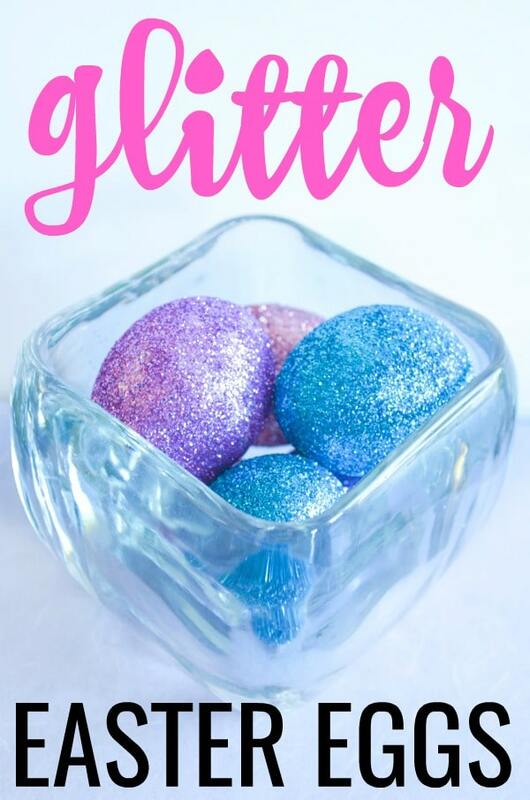 Don’t forget to pin this glitter decorated Easter egg tutorial for later! Top 10 Easter Books for Kids. How do you decorate for Easter? 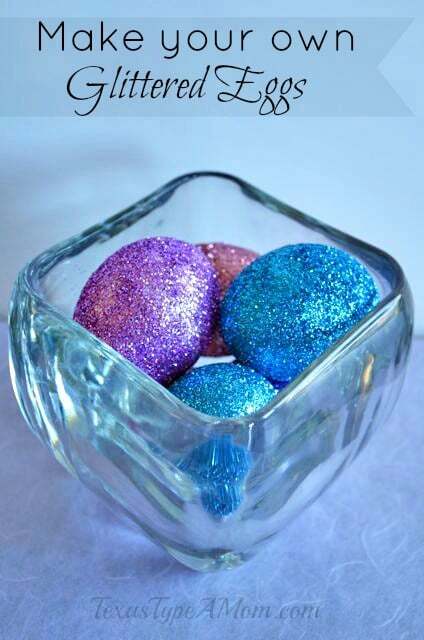 Have you ever made glitter Easter eggs? Any quick and easy decorations you have to share? Those are fantastic and would really make a lovely tablescape and/or decoration. Anything really! Those are gorgeous! What a great centerpiece for Easter. These are so pretty! I love the pastel colors for Easter. Oh my, I can’t even tell you how much I love these. What a cool idea!! Oh my goodness how pretty are these! Love this tutorial! Beautiful!! My boys wouldn’t care for these, but I LOVE ’em!! Thanks! These are beautiful! I was just wondering yesterday, as I blew through 12 more eggs for Easter decorating, if anyone else was still blowing eggs. So cool to see you mention it! I will have to try this method, I have a bottle of Mod Podge right here and kids are asking for something different. Thanks for the great idea! They turned out absolutely beautiful! Ive never blown eggs. I’ll have to try it. Those came out great! Love making glitter eggs and Modpodge is my favorite! ooooohhh so so so pretty!!!! These look fun!! Although my toddler is all boy/bulldozer, so I may need to save this for my step daughter and I! 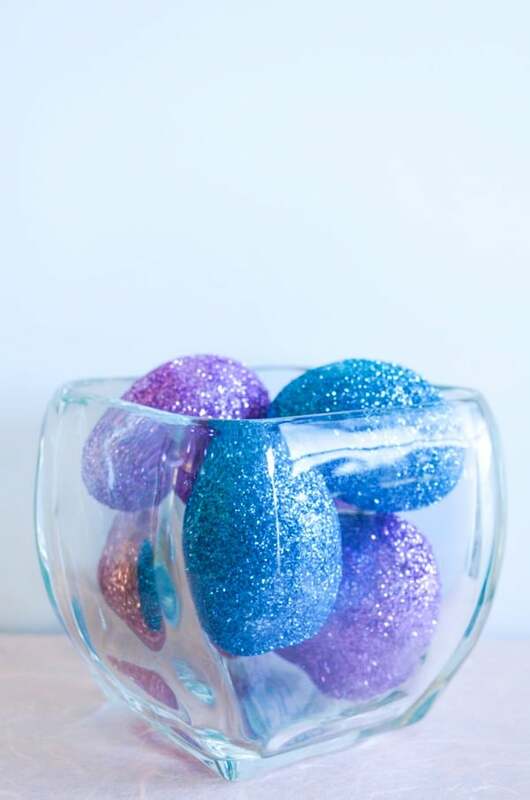 I love anything with glitter- totally making these next year! OH So pretty! I wish I had seen this before Easter. Pretty! Thanks for the mention!